Nate Marquardt faces C.B. Dollaway this Saturday at UFC on FOX 17. The former number-one contender has fallen on hard times. He is currently 1-5 in his last six fights. Even more distressing is the fact that he is getting knocked out at mucher higher rate and absorbing more strikes than ever before in his career. 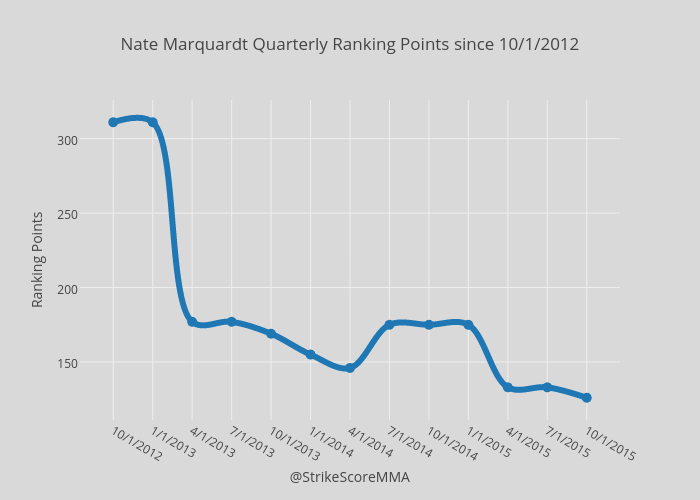 Is this is a decline in physical ability or is Marquardt simply facing better opposition? In his last seven fights, six out of his seven opponents have landed over two significant strikes per minute against him (per Fightmetric). Prior to his fight against Tyron Woodley in 2012, only two of Marquardt’s opponents in his Strikeforce/UFC career, had been that successful against him, Anderson Silva and Chael Sonnen. Marquardt has been knocked out in three of his last five bouts. Before he faced Jake Ellenberger in 2013, he had only been knocked out on one occasion, his title fight against Silva. During the same stretch, he scored only one knockout, a come-from-behind win over Woodley. In his preceding seven fights, Marquardt scored knockouts in four of seven bouts. He was getting hit less, landing more knockouts and getting knocked out less. Plus, he was actually facing, on average, higher ranked opposition. 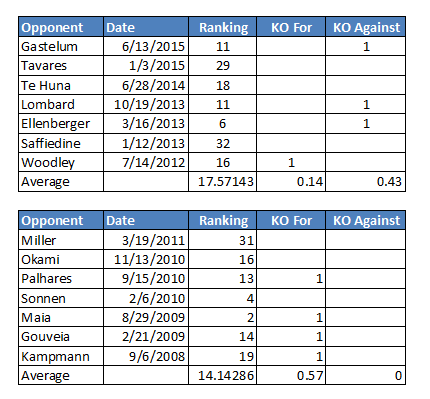 The following chart shows the stark difference over the course of his last 14 bouts. Ranking here refers to the Fight Matrix Generated Historical Ranking from the quarter in which the bout took place. As you can see, Marquardt’s ability to avoid strikes and take punishment as well as his offensive striking power numbers have mostly fallen off a cliff. The last time we saw the veteran in the Octagon, he was telling his corner that “he had nothing left” as he quit on the stool against Kelvin Gastelum. Without an unlikely return to form against Dollaway, it might become harder to ignore the growing number of calls for Marquardt to retire from the sport. The following graph shows his decline in rating points since the victory over Woodley. The good news for Marquardt is that Dollaway is not really a power striker. In his 16 UFC bouts, he has two knockouts against Cezar Ferreira and Mike Massenzio who hold highest quarterly rankings of 41 and 35 respectively. However, Gastelum had never scored a knockout in the UFC before their fight, and Marquardt still had nothing left.